For many years the Stourbridge Town Arm, like most of our canal network, was underfished and going to waste. 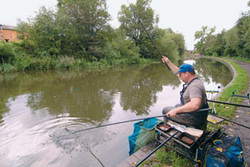 However, a couple of years ago, the Halesowen Royal British Legion (HRBL) club took over management of the fishery. Since then the stretch has been permanently pegged and opened up to day ticket anglers. Open matches are now organised quite regularly and club bookings are taken too. The canal has an amazing head offish, it has produced bream to 6lb, tench to 6lb, roach to 2lb, perch to 3lb, chub to 5lb and carp to 15lb. The canal was built to serve the local glassmaking industry and comes to an abrupt end at what is now a boat yard next to the Bonded Warehouse, just a stone’s throw from Stourbridge town centre. Turning off the main ring road into Canal Street, on to the cobbled approach road you can park up and leave it there. It’s usually best to stake the bottom end of your keepnet so that it doesn’t get swept through your peg when the tow picks up or a boat comes through. On canals, it is particularly important to accurately plumb the depth right across your peg, so you can find the bottom of the ledges and fish there very accurately if you choose to. One of the keys to fishing this canal successfully is to give yourself at least a couple of lines of attack. You should choose a line and method on which to catch small fish, such as squatts or punch just up the near or far ledge. You should also have a line on which to set a trap and try for bonus fish every now and then. This could be casters or worms down the track or up the far shelf, especially if there is cover there. £2.00, available on the bank. Club bookings taken. Slight left onto St. John's Road/​A491, Slight right onto New Rd, Continue onto Greenfield Ave/​A491, Continue to follow A491. Turn left onto Canal St and the canal will be on the right.